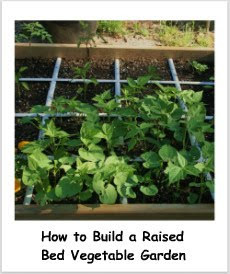 Just like most of my gardening efforts here, I have no expertise beyond trial and error on growing watermelons, and this post is really pretty much for next spring, since watermelon growing season is over now. Though it might be for just a little bit of showing off too. Maybe. Just a little. You see, it is the first watermelon I have ever grown in my nearly 53 years of life. (Yes, I have a birthday next month and it marks year 53. I can hardly believe it myself) Anyway, I can't believe it! I actually, finally grew a watermelon! Okay, well, the truth is that last year was the first year I ever actually tried, but that was pretty much a bust. But lookie loo at that purtay thing! And it was nice and tasty too. 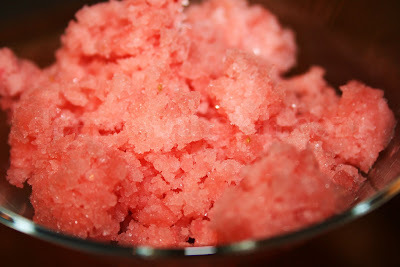 I think the rest of what I have left will go toward another batch of Watermelon Granita because that stuff is good, and it's still watermelon granita hot down south. Take the rind and make some Watermelon Rind Pickles too if you like. Like last year, I grew this type - a Jubilee watermelon - in a container along with another another watermelon called Moon & Stars - lost one M&S but another one has cropped up, so we'll see. For my veggie gardens I do both containers and square foot raised bed gardens, but knowing that watermelons require a lot of room to groove, I didn't want to dedicate a full raised bed to a single watermelon plant, so I decided to try it in a container and to try something a bit different. I laid out a section of several layers of landscaping fabric roughly about the same size as a 4' x 4' garden. Last year I simply placed the pot in the center and then just reigned the vine in whenever it tried to venture outside of the "bed." But... my yard turtle girl (now multiple turtles) ate the fruit just about the time that it began to set! This year, I made a border "fence" around the container using cinder blocks to keep the turtles out. Then I stuck some of those individual decorative fence sections in the cinder block holes as a trellis for the vines to crawl on to give it some good air circulation. While this may look a little funny, it helped to keep the turtles out and the vines contained. 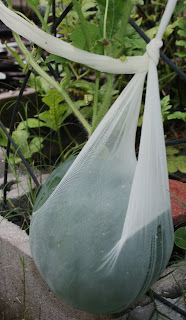 The jubilee pictured above starting growing as a baby on the pseudo trellis before I caught it, so I made it a little sling from an old stocking just in case it dropped, but then it stretched down to the top of the cinder block where it rested until it was ready to pick. I thought I took a photo of the sling but apparently I only thought I did. The picture below is the Moon and Stars watermelon hanging out waiting for me to figure out when it'll be ready to pick. You basically just wrap the watermelon in a stocking that you tie off to the trellis. That way if it breaks off of the vine as it ripens, it doesn't fall to the ground and crack. You can also make it into a hammock, tying it off at both ends and resting the watermelon in the middle. The biggest challenge with doing a container for watermelons is keeping up with the water needs - they like deep and regular watering and you have to keep an eye on containers, especially in hot and humid weather. And keeping the squirrels out of the pots if you live where I do. Oh, and figuring out when to pick the darned thing! Seems it's a bit of a gamble, especially if they are hanging out in a sling instead of laying on the ground. Anyway, here's the basics for next year. Don't plant them too early - they need warm soil to grow, and about 3 months of hot weather. You can start the seeds inside, using grow lights (about 18 hours out of 24 and at 80 degree temperatures), about a month before the last frost, but plant them in peat pots that don't need to be removed since they don't take well to having their roots disturbed during transplanting. Transplant the pots about 2 weeks after the last spring frost has passed, following the package for depth and spacing. 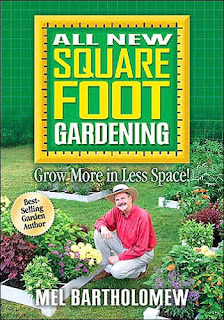 Besides giving them lots of room, they need a good soil mix that drains well, so they don't have soggy feet, and a full 8 to 10 hours of sun. The smaller, globe shaped, ice-box varieties of watermelon, like Sugar Baby, generally don't grow more than 12 pounds or so, and will do well on a trellis, fitting in well with vertical growing in the Square Foot Garden, so long as your vertical frame is well supported. You need to reserve two squares for each melon plant. Cucumber beetles are one of the bigger pests of watermelon and will damage both the leaves and the stems. Apply a general purpose insecticide - but stop using it once the plant begins to vine out - or use row covers instead to protect the plants in the early stages, removing them once blooms show so that bees can pollinate them. Cutworms, mildew and wilt are problem areas for melons. Fertilize with 10-10-10 at a rate of 1-1/2 pounds per 100 square feet. 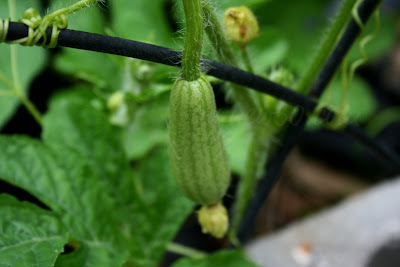 Just like squash and cucumbers, watermelon will have both male and female blooms. Male flowers usually are smaller, often appear first and just fall off. Female flowers have tiny melons under the bloom - you can see the bloom on the bottom in the picture above. Pollination happens when the bees carry pollen from the male to the female, though you can also hand pollinate if you're not getting any melons. Well this one is a mystery to me yet. Some people go by a thump on the melon, but apparently I can thump all day but not tell the difference between "thuds." Some people say that looking at the underside is the best indicator because the skin underneath becomes tough and dull looking when it is ripe - that is, of course, if it has grown laying on the ground, and not trellised. Another method is to look at the curlicue where the melon attaches to the vine. Once that begins to dry up the melon is ripened. Yet another is to hold the melon in one hand and the stem in the other and give a twist - if it resists it's not ripe. Best advice is to check the package for the date to maturity and factor that in from the time planted to know when the melons should be ripe. On average a melon is about 12 weeks from seed to harvest. Once picked a melon will not continue to ripen, so the key is figuring out when it is at it's best, pick it and eat it soon after! Jubilees have bright red flesh and can grow as large as 25 pounds and even bigger. Of course, like everything else that I grow, mine was nowhere near that size! But... it was still nice and sweet and I sure enjoyed it. Try growing one next spring! Thanks to these two resources for the guidance! 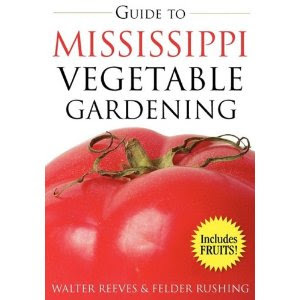 Guide to Mississippi Vegetable Gardening - available for most states. 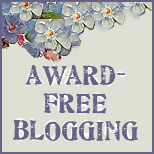 Disclaimer: I am a simple home garden struggling through my failures and relishing in my successes and sharing both of them with you, the reader. If you are thinking I am any kind of expert, you might want to read this little ole disclaimer right here. Well, I'm impressed. 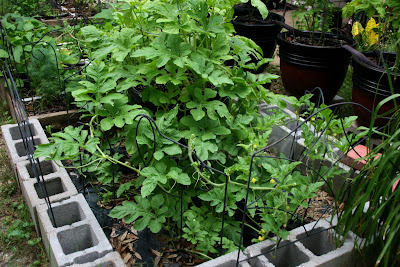 Watermelons, which were easy to grow 40 years ago, have become very difficult to grow in the home garden, in my opinion! Oh my gosh Mary beautiful photos and watermelons for that matter! You are the garden queen, I tell you. You're older than me. You're older than me. I don't turn 53 till next May! Sorry, but since I am the oldest of all my friends, I am postitively gleeful to find someone older. I read an article in my local paper about a local produce grower who grows watermelons. 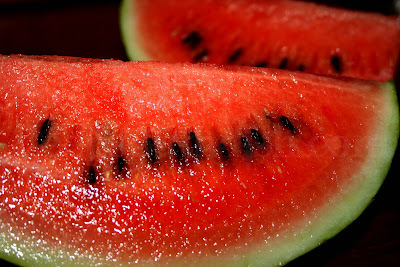 The article quoted him as saying that when the tendrils turns brown, you know the watermelon is ripe and ready to pick.